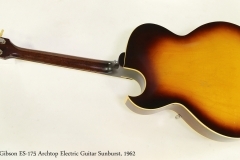 Introduced in 1949, the Gibson ES-175 was one of the earliest successful production electric guitars, and has stayed in production with minor variations since. Originally featuring a pair of P-90 pickups, in 1958 the new Gibson humbucking model was added. 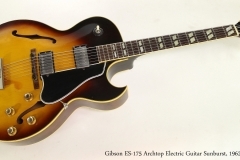 The Gibson ES-175 was immediately popular with jazz players. The body is constructed as a single florentine (sharp) cutaway, using maple laminates for feedback rejection. This was becoming increasingly important as audience sizes increased, requiring higher stage volumes that are seriously problematic for hollow body instruments. These work so well that eventually, an ES-175 built not long after this one wound up on some of the world’s largest rock stages in the hands of ‘Yes’ guitarist Steve Howe. Here we are looking at a Gibson ES-175 produced during 1962 at the historic Kalamazoo, Michigan plant. It’s all original except for the rosewood bridge and a refret. A very notable feature is that its pickups are the original Patent Applied For or PAF models. The wiring is original and has not been altered. The finish has a mark under the tailpiece, caused by a reaction with a foam damper. Otherwise, the finish is in very good condition with only light marking and a few small chips around the edges and in the standard wear area of the back. This guitar has been refretted, and plays well. It’s strung with DR 11-49 flatwound strings and sounds great. The original brown Gibson hard shell, arched top case is included, and it is in correspondingly good condition. Inside the case pocket, two original cards are included from Gibson. One identifies the guitar as an ES-175D, for Double Pickup, however the guitar’s label says only ES-175. In its first release, the Gibson ES-175 was a single pickup model and the two-pickup ES-175 D appeared in 1952.